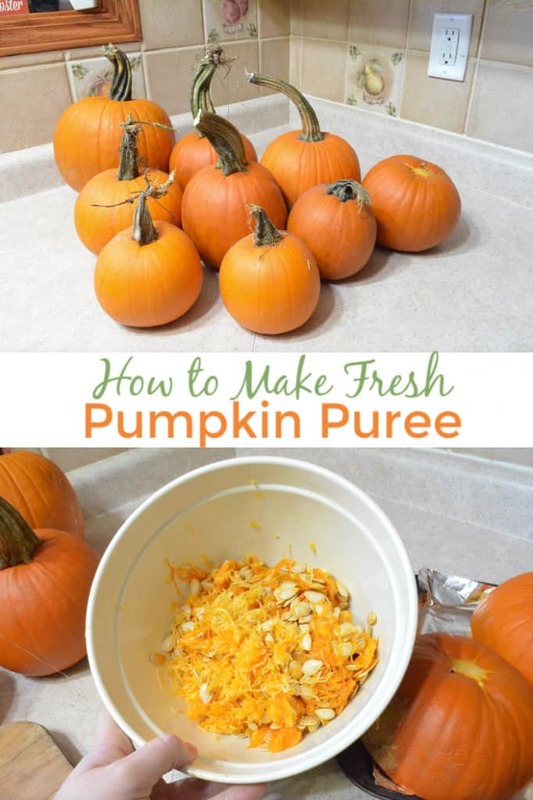 Making your home fresh homemade pumpkin puree recipe takes a little bit of time but it is EASY to do! 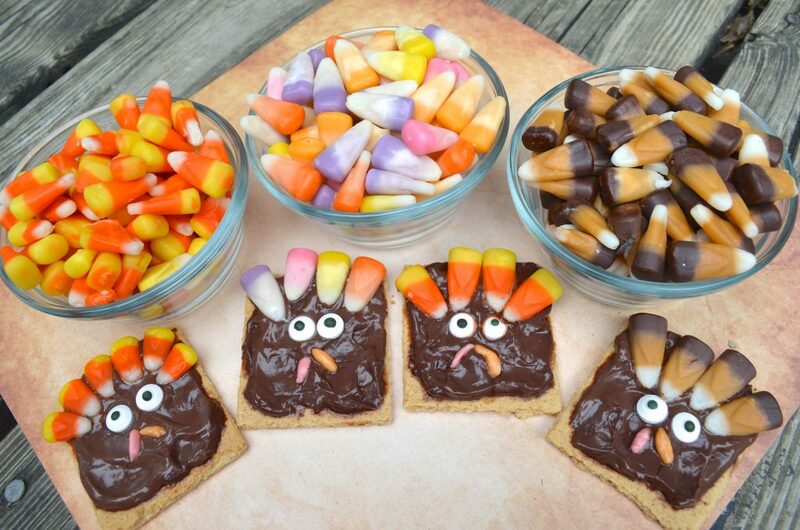 It’s a great way to eat healthier and control what ingredients you use when making your pumpkin pie and other pumpkin flavored desserts. Below I’ll walk you through step by step how I make my homemade pumpkin puree. First you’ll want to start with choosing the right type of pumpkins! 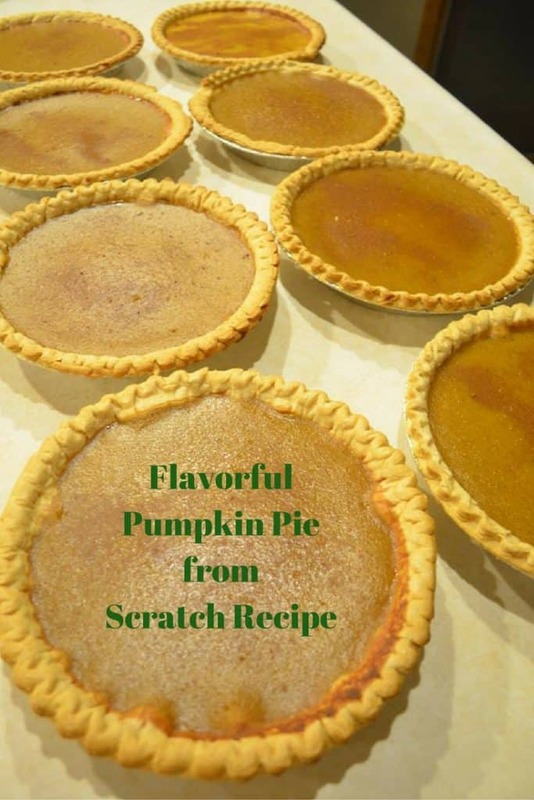 You will need pie pumpkins to bake to make your own pumpkin puree. 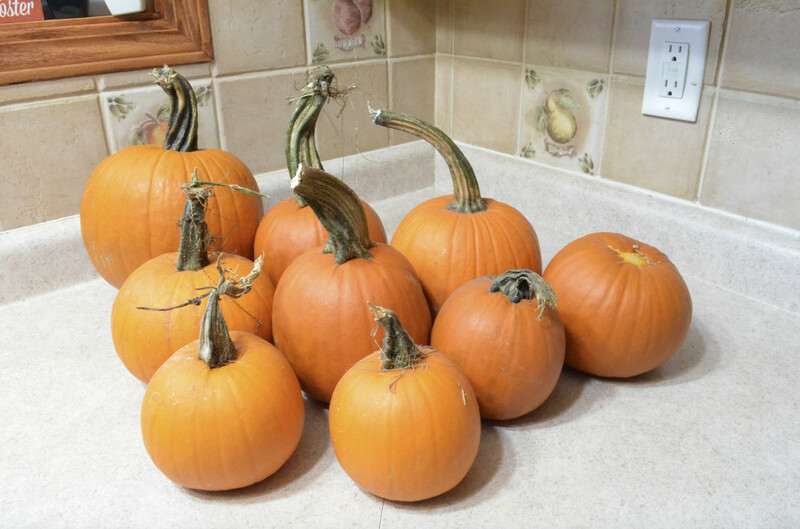 You CAN use jack o lanterns, and I do often, but the pie pumpkins are sweeter and most desirable for pumpkin dessert recipes. You can grow your own, buy them at the grocery store, or buy them from a local farmer depending on where you live. The great thing is that you CAN freeze your pumpkin puree to use for another day! I like to make huge batches of puree to last for the year and then just put them in the freezer to use later! Start by making sure your pumpkins aren’t covered in dirt! If you bought them at the grocery store then they are probably pretty clean. Mine came from the garden so I had chunks of dirt on mine to wash off. 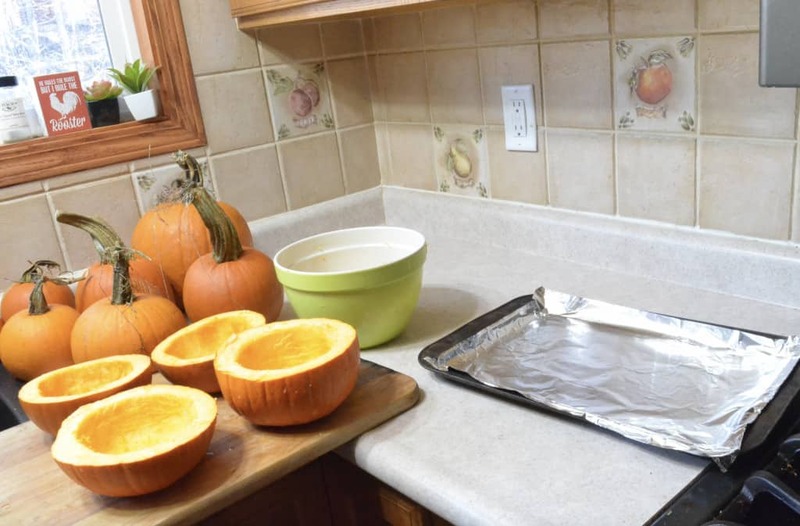 If you’re using pie pumpkins you’ll want to cut them in half. If you’re cutting up a large jack o lantern you may need to cut it into quarters so that it will fit in your oven. 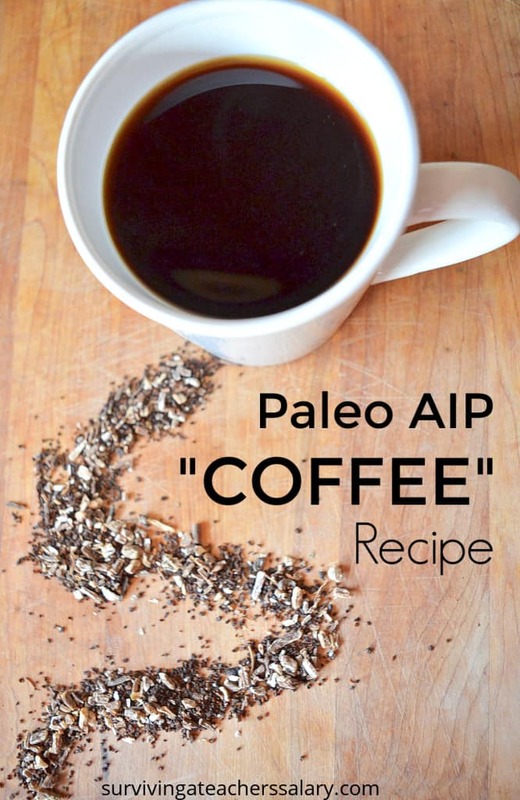 Use a spoon or pumpkin scooper to remove all of the flesh and seeds inside! Once you’re done cutting all of your pie pumpkins up and scraping out the pumpkin seeds and stringy mush you’ll have a bowl full like I did. This is what I use to bake pumpkin seeds with. You can get even bigger pumpkin seeds from your jack o lanterns! To bake our pumpkin seeds recipe look here. 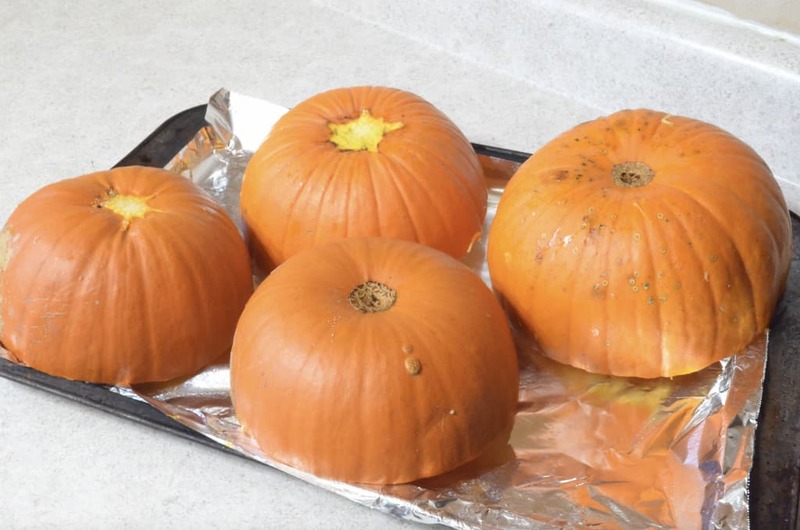 In a shallow baking sheet covered with aluminum foil, place as many pumpkins as you can (usually 4 halves) inside part down onto the foil. Here you can see I have four pumpkin halves inside faced down. Make sure to add about 1 cup of water to the bottom of your pan to provide moisture for steaming as you’re cooking your pumpkins! Bake at 350* for 30-40 minutes. Let cool enough to handle. Then just scrape out the inside flesh/meat of the pumpkin into a bowl! 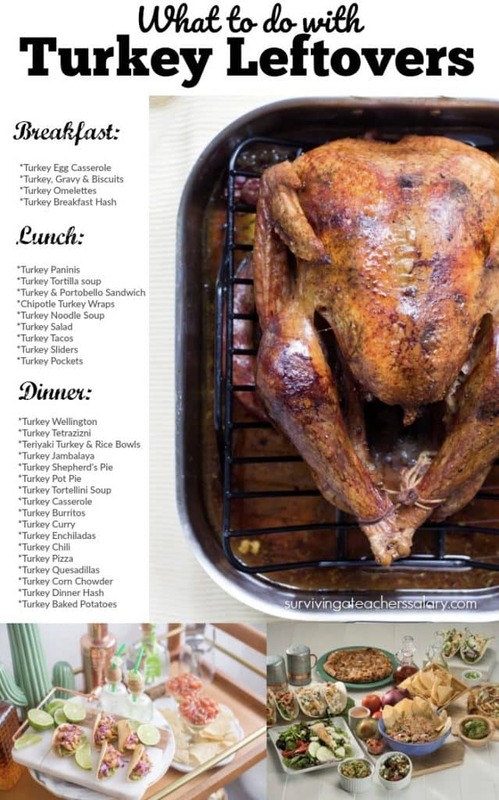 You can discard the skin portion of the pumpkin outside in a compost bin, throw out for the chickens, or simply just throw away. 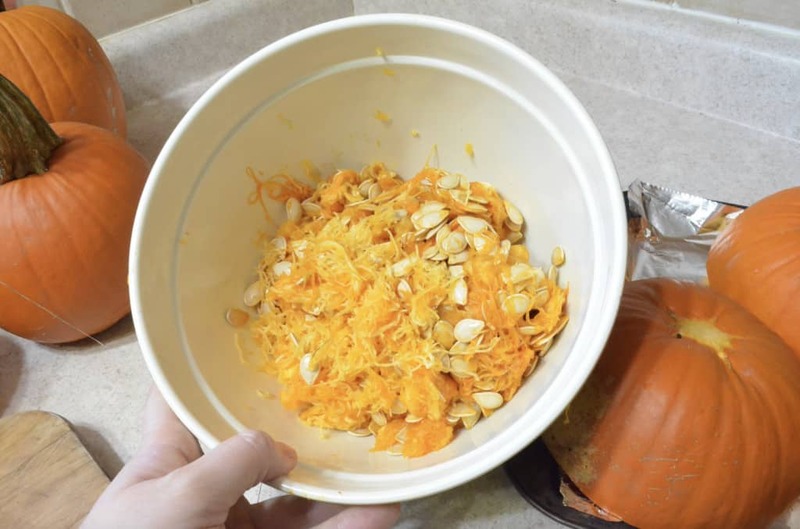 The very last step is to place all of your pumpkin mush into a food processor to blend it down! Now you’re ready to bake with it fresh or freeze for later!